Millennial fans of baseball account for 18% of the adult population in the United States. The top markets are found to be in Philadelphia, Milwaukee, Hartford, Albany, and St. Louis. Almost 40% of baby boomers are fans of baseball, but slowly decreases towards newer generations. Baseball is loved by women and men alike. A listing of funny coed baseball team names are compiled below from existing competitors to help encourage your own name and team creation. 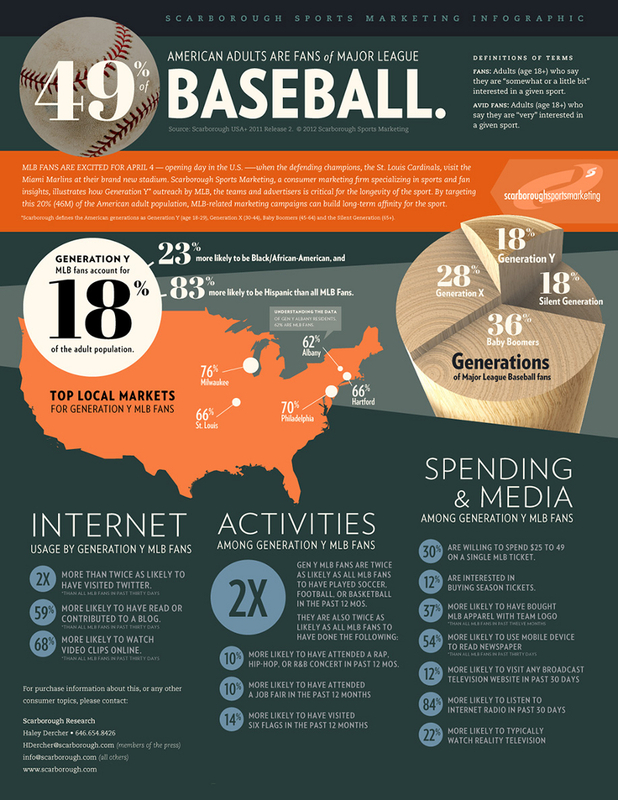 Marketing to Generation Y baseball fans can mean adjustments to your current marketing strategy. The average millennial is willing to spend $25 to $50 on a single ticket and are more interested in season tickets. Over half of these fans are more likely to use a mobile device to read the newspaper and keep updated. The below infographic takes a look at the activities and trends of MLB fans.